Yes, the ESPN business is shrinking. But that won't be enough to knock the entertainment giant off its record growth path. 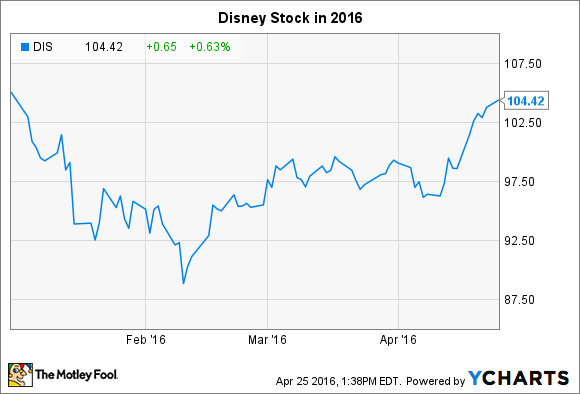 Four months into 2016 and still in the red, Disney (NYSE:DIS) is one of the worst-performing stocks in the Dow so far. Yet shares recently crossed $100 for the first time since January following a 17% rally. The House of Mouse isn't likely to announce good news on its ESPN-anchored TV business when it posts quarterly results on May 10. That operating segment was Disney's worst performer last year, thanks to slowing growth and slumping profitability as subscribers dropped cable bundles in favor of Internet-delivered entertainment. That negative trend will probably continue into 2016, but he entertainment titan has other levers to pull to keep operating results churning higher. Disney's studio business almost doubled its profits last quarter as earnings touched a record-high $1 billion. That epic run was mostly due to a blockbuster franchise introduction, Star Wars, that investors can't count on recurring with any regularity. Yet as great as they are for the business, Disney doesn't need Jedi-fueled global wins like that to keep the theater business growing. So far this year, it's already succeeded with solid hits from its animated studio (Zootopia) and its Disney Pictures unit (The Jungle Book). Next up is Captain America: Civil War and what's likely to be another top Marvel film. Between Pixar, Lucasfilm, Marvel, Disney Animation, and Disney Pictures, there's no shortage of opportunities for Disney to raise the bar on box office sales this year. Disney executives aren't exaggerating when they describe the consumer products business as "uniquely broad and deep." The company owns an incredible 11 franchises that each rake in at least $1 billion of sales (up from eight last year), including Mickey Mouse, Cars, and recent additions Avengers and Star Wars. These brands get support from Disney's box office, TV broadcasting, and streaming video initiatives, which is why the consumer products division tends to spike following successful content releases like a Frozen movie or a Marvel TV show. Last quarter, for example, consumer products posted a 23% earnings jump on an 8% rise in sales. That success translates into an operating margin that, at 45%, far outpaces the media, parks and resorts, and film entertainment segments. If toy giant Hasbro's latest results are any indication, Disney likely had another strong licensing quarter thanks to surging Star Wars and Disney Princess product sales. Disney welcomes its first official guests to the Shanghai, China, resort in June and so far all investors have seen are expenses tied to building this massive new park. More significant hits to earnings are on tap, too, with $300 million of pre-opening expenses forecast over the next few quarters. Given that the park will only be operational for just one of Disney's fiscal 2016 quarters while opening costs are spread out over all of them, the launch will drag down the parks' profit this year. But the bold bet should start paying off in 2017 and then for decades after that. Disney said that its website attracted 5 million viewers within half an hour of making tickets available for purchase in late March. That enthusiasm helps confirm why executives have been talking up the importance of this opening. "You can expect that [Shanghai Disney] is going to drive growth for Parks and Resorts for many years to come," CEO Bob Iger told investors back in February .